On a show full of socially awkward physicists, the appearance of Stephen Hawking was sure to set Sheldon’s mind abuzz. In “The Hawking Excitation” (one of two guest appearances from the world-famous theoretical physicist), Professor Hawking travels to CalTech to lecture. Sheldon sets out to meet his idol and is delighted when Hawking requests a meeting with him to discuss Sheldon’s paper about the Higgs boson. To Sheldon’s deep embarrassment, Hawking points out a simple arithmetic error that voids his entire findings. As a guest star, Hawking brought a light and humorous touch to the show, playing his rock star physicist status for laughs. Buzz Aldrin, the second man to walk on the moon, brought laughs with his brief guest appearance in “The Holographic Excitation.” Trying to convey to Howard how obnoxious he has been by droning on about his recent trip to space, Raj sends him a clip of Buzz Aldrin. Aldrin is handing out candy at Halloween — Milky Ways, Mars bars, and moon pies — boasting, “I’m an astronaut!” to costumed children. His willingness to make fun of himself was delightful for viewers. Perhaps best recognized for her role in “Cybill,” Christine Baranski has appeared in several episodes of “Big Bang Theory” as Leonard’s mother, Dr. Beverly Hofstadter. Playing a psychiatrist, Baranski brings huge laughs for her cold, analytical style. Especially amusing is her ability to understand and get along with Sheldon, who shows uncharacteristic affection and admiration toward her. The gang heads to San Francisco for a conference, sharing their train car with Summer Glau, the actress from “Terminator: The Sarah Connor Chronicles.” The fanboys each try to come up with clever lines to hit on her. Unfortunately, Glau seemed uncomfortable and awkward in her guest appearance. The jokes fell flat and she lacked the charm and self-deprecating humor of more successful guest stars. When Howard needs a special security clearance for a project, FBI Special Agent Angela Page (played by Eliza Dushku) is sent to interview his friends as character references. Unfortunately, Dushku came across as bland and uninteresting. 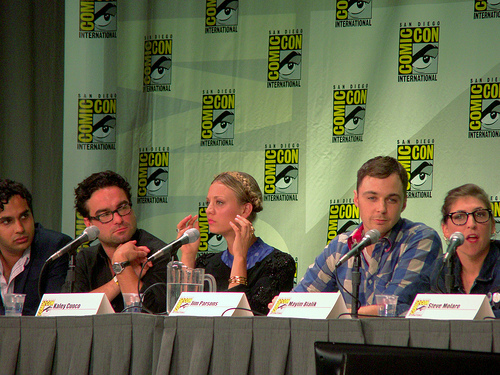 Her character reiterated tired ground (Raj being unable to talk to women, Sheldon’s social awkwardness) that did nothing to advance the plot of the episode. Fans of the show eagerly anticipating Season 7 can DVR the show or access it through mobile devices after you get Direct TV at home. ← What Do We Want From The Next Tomb Raider Game? B.B.T. has got to be one of the most innovative & clever shows on the tele & sheldons foibles are so squirm inducing you just cant help to L.O.L. Ah come on, how can you not mention Bob Newheart!